Forget the refugee claimants, it’s the Canadian citizens we can’t afford! So said Citizenship and Immigration Canada (CIC) in its March 30, 2010, news release, Balanced reforms planned for Canada’s asylum system. How, we may ask, did they reach such a number? Interestingly, $50,000 was exactly the figure advanced by some government officials in the early 1990s for the cost per claimant of refugee determination. The CCR challenged the government on the figure and Citizenship and Immigration Canada in 1994 conceded that there are “sufficient difficulties” with some of the assumptions behind the figure of $50,000 and promised to discontinue using it in the future. But now here we are in 2010, back with $50,000. Is there something special about this figure? The response to an Access to Information request reveals all. Well, maybe not all. A whole lot of the relevant figures and assumptions have been whited out, the government claiming an exemption under “government operations”. They never managed to reach the figure of $50,000. They calculated an average of $47,935 per refused claimant, based on the claimant being in Canada 50 months. Presumably they felt they could just round that up to $50,000. The figure of $47,935 is based on a number of questionable assumptions about the average refused claimant. Most importantly, it assumes that 75% of refused claimants are receiving social assistance (for a per claimant average of $22,650, nearly half of the total). Or you could look at it as assuming that the average refused claimant is on welfare for 75% of their time in Canada. CIC has no actual data for the percentage of claimants on welfare, so they extrapolate from other data that is not necessarily relevant (data for all refugees, including resettled refugees immediately after landing). They ignore their own observations that (a) the longer people are in Canada, the less they rely on welfare, and (b) refused claimants are more likely to have come for economic reasons and therefore to be working. The other big items are: $7,269 for education, based on 17% of the claimant population being of school age, and $2,300 for health care (a monthly average of $46 for Interim Federal Health (IFH) over 50 months – all figures are based on the claimant being in Canada for 50 months). The costs actually associated with the refugee determination process are just $6,473 – remarkably cheap for a system considered to be among the most credible in the world! The $47,935 figure for average costs is not credible, given the extremely dubious assumption of 75% reliance on social assistance. But the biggest flaw in the calculation is that they consider only the costs, and none of the benefits – one of the most basic errors in economic analysis. Even according to their deeply unconvincing estimate of social assistance rates, 25% of these “average” refused claimants are working – and paying taxes. And all claimants are also paying consumption taxes. Add in the same figure for school and average amounts for a few of the benefits that claimants don’t enjoy (university and universal child care benefit), and we get to $35,000. This is just the beginning – it doesn’t include other benefits I can’t readily find numbers for, such as Child Tax Benefits and Old Age Security. This $35,000 for the average Canadian is just for 50 months. But the average Canadian can’t be deported, so we are stuck with the expenses for a whole lifetime!!! 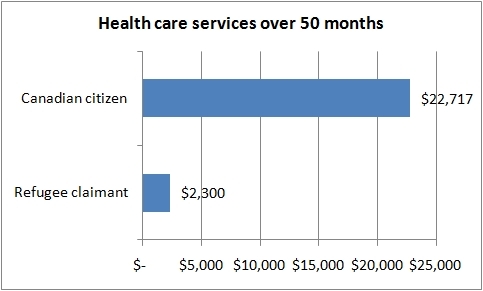 Based on life expectancy of 80 years, the average Canadian is costing us over HALF A MILLION DOLLARS! Clearly it doesn’t make sense to consider only the costs of a Canadian. It makes no more sense for refugee claimants. Once we start considering what people contribute to the system, we may notice that claimants pay the same taxes as Canadians, but they don’t benefit from anywhere near the same range of government services that Canadians do. Some of the taxes paid by claimants go to support, for example, health care services that they can’t use. In that sense claimants are actually paying for Canadians, rather than the other way around.